Tablets have become commonplace these days, and with all the varying sizes and shapes, the AirTurn Manos universal tablet holder has become the go-to mounting solution due to its premium performance and ability to accept the widest range of devices on the market. However, as more classrooms and homes integrate this enhancing technology, the dilemma becomes mounting for efficiency. Tablet mounting in a way that enhances your project without cluttering the workspace brings forward the true value. The AirTurn Desktop Clamp offers a convenient solution by allowing the user to mount their tablet to the side of most tabletops, creating a clear workspace. Easily attach the AirTurn Manos universal tablet holder to provide a perfect view of the tablet. In the Kitchen! Mount your e-recipes safely out of the way, yet in perfect view. In the Classroom! Keep your desktop clear for easy note taking as you read or watch your tablet. In the Workshop! Watch your favorite DIY video, keeping your workspace clear to follow along. In the Office! Conveniently mount a VOIP phone for improved efficiency. 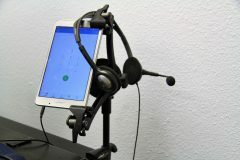 The AirTurn Side Mount Series offers progressive solutions by allowing the user to mount their tablet or other accessories to the side of most microphone stands, presenting a customizable setup. The classic SMC allows the display of lyrics/slides conveniently in view without compromising the traditional placement of a microphone. The SMC-EX offers greater control with adjustable length. The SMC-EX2 offers greater customization options with a double extension. Create premium display and maximum adjustability when used with the AirTurn Manos universal tablet holder. Perfectly positition your AirTurn Tap. Add an audio or video recorder to your setup to capture the performance. 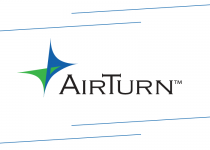 Use any AirTurn bluetooth pedal for hands-free activation or check out the AirTurn Digit-3 for a hand-held option. 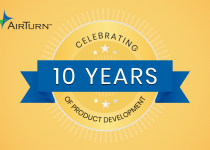 The AirTurn GoStand-Boom combo package offers greater accessibility when reading or watching from a bed or recliner. Find your perfect hands-free display.